Kevin has over 25 years’ experience in sales, marketing and general management. He joined Britvic in September 2008 as Marketing Director and was appointed Managing Director in June 2013. He is a member of the Britvic PLC Executive Team in London. Prior to Britvic, he spent four years as Sales & Marketing Director of Dairygold Consumer Foods Division. Nick Johnson joined Unilever in 2011 as Business Operations Director within its customer development arm in UK. He assumed the role of Category Management & Business Operations Director in July 2011. In October 2013, he took on the leadership of its Shopper Marketing arm, whilst retaining the category management function. He was then appointed Vice President and Country Leader for Unilever Ireland in June 2014. 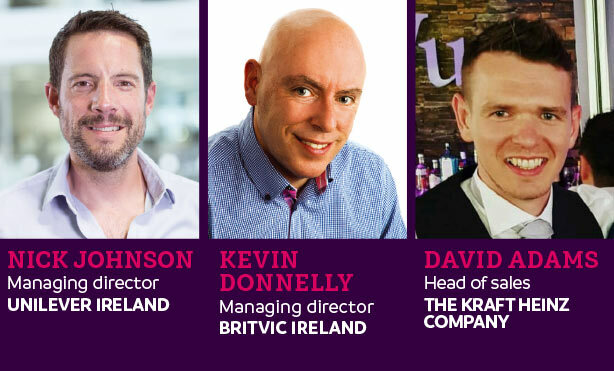 David Adams joined The Kraft Heinz Company Ireland in September 2017. As head of sales, he is the commercial lead for the Ireland business. David moved to Ireland from the UK where he joined Kraft Heinz in September 2014 as national account manager within the foodservice arm. He quickly progressed to the retail division, heading up the sales team for a top four UK multiple. After graduating from university with a BA (Hons) in Marketing, David worked for Philips UK in various sales and marketing roles. He also worked for Thornton’s in a commercial role, leading the convenience symbol channel. For more about the event, visit: Checkout Conference 2018.